So I’ve been complaining about the cloudy, rainy weather all this week during our stay in Portland. Well, I finally got my wish–a change! Yesterday, there was this bright, glowing ball that appeared in the sky for a few short minutes. I feared that it was a nuclear explosion or an alien invasion. However, apparently the locals call this thing the sun. And get this: we are lucky enough to be here for its semi-annual appearance. How sweet is that? Furthermore, we awoke to snow on the ground on the ground this morning. It quickly melted. Now we are in a vicious cycle of clouds, hail, rain, clear, sun, repeat. Now that’s change I can believe in. Hold on, it looks like I’ve got some moss starting to form on my back from all the rain. I’d better take care of this. Signing out for now. It has been snowing like crazy this evening. I would guess 3-4 inches so far and “it doesn’t show signs of stopping.” The wind is also blowing, so it’s creating some amazing snow drifts. My best friend John hates the snow, but I love it. So we’ll just agree to disagree on this one. 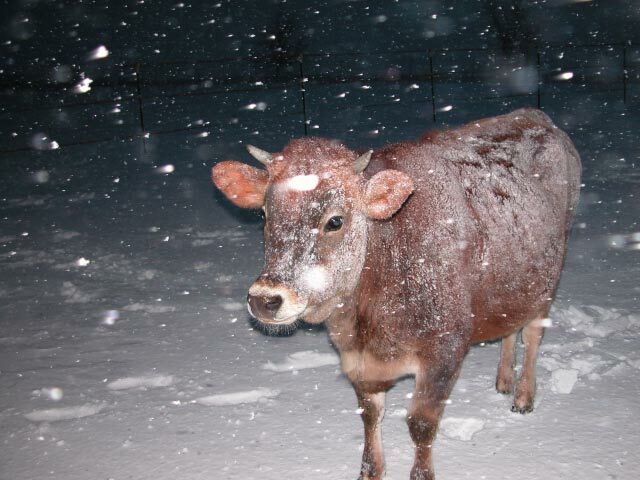 Anyway, I wanted to share a couple of pictures I took of our livestock out braving the elements. This is Todd. He’s our lovable, friendly steer. He is very sociable, but doesn’t know his own strength. He can give you a nudge in the behind with those horns that’s just a little too friendly (and painful). 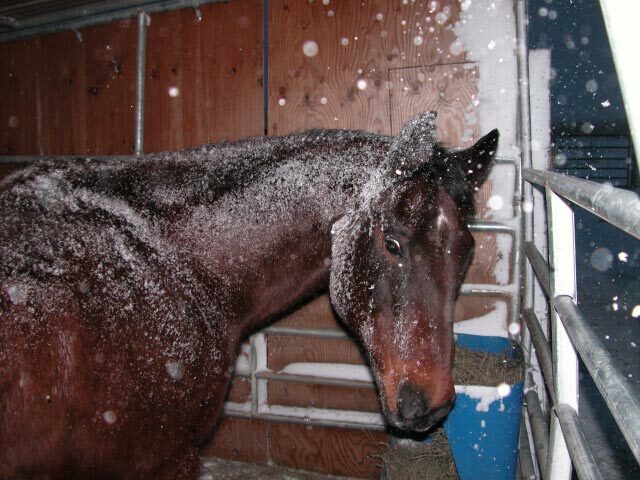 This is Lefty, our gentlemanly Quarter Horse. He is very gentle and loving. Here I am interrupting his dinner to get a quick candid shot. It’s been snowing all day and it may continue into the evening. We’ve probably got about 5 inches on the ground. I’m looking out the window right now and it’s white as far as they eye can see. I love it! Winter is probably my favorite season. I’m looking forward to taking the kids out sledding in a little bit. We are fortunate enough to have some land and an ATV. So I’ll be dragging them all over the place. You know, I think it’s simple pleasures like this that make some of the warmest, lasting memories. Big trips like going to Disneyland and such are always awesome and definitely memorable. But there is definitely something to be said for the smiles and giggles on the kids’ faces as they slide down the hill. The rosy red cheeks. Then warming up with steaming hot chocolate afterwards. Priceless moments.